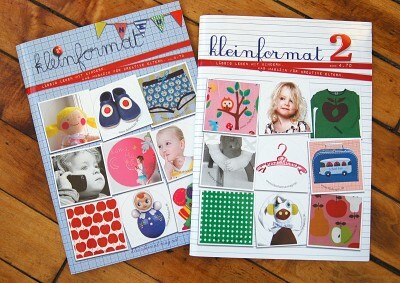 Kleinformat is a new Austrian magazine about kids, design, and crafting. Each adorable cover features images from inside the magazine which double as stickers that can be peeled and used as desired. And the design inside is equally as clever and unique as the exterior. If I could read German, I could tell you for sure. 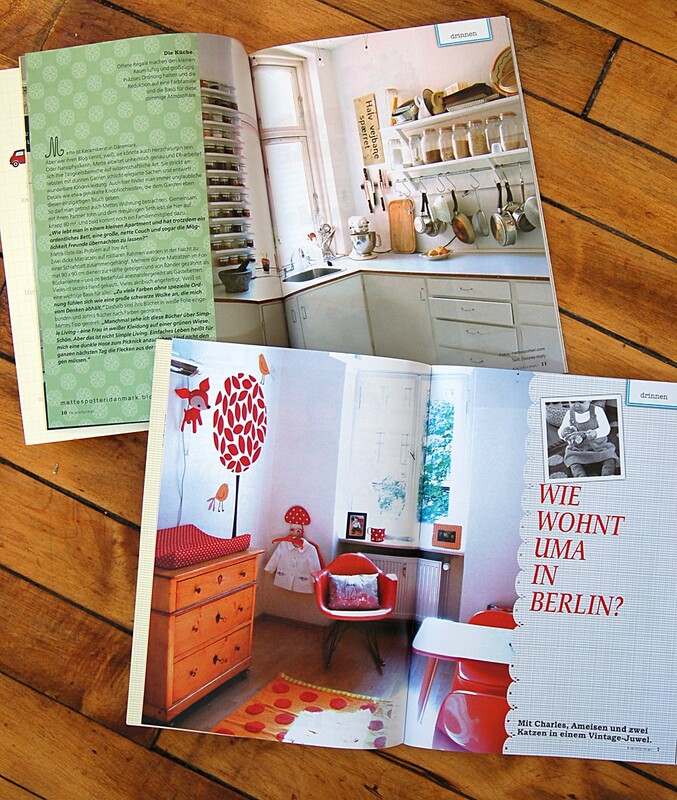 But I think each issue includes a feature on real-life interior design. There are a couple very cute houses featured in both of the first two issues. I love the styling of the kids’ fashion features. 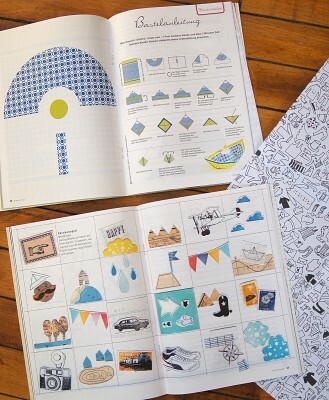 And the magazine also includes clever projects for adults and children, highlights of unique and well-designed new products, interviews with people who I’m certain are very interesting and have lots to say, a feature about visiting different European cities, and a large sheet of printed paper to be used for scrap-booking, gift wrapping, etc. Or at least that’s what it seems to be. 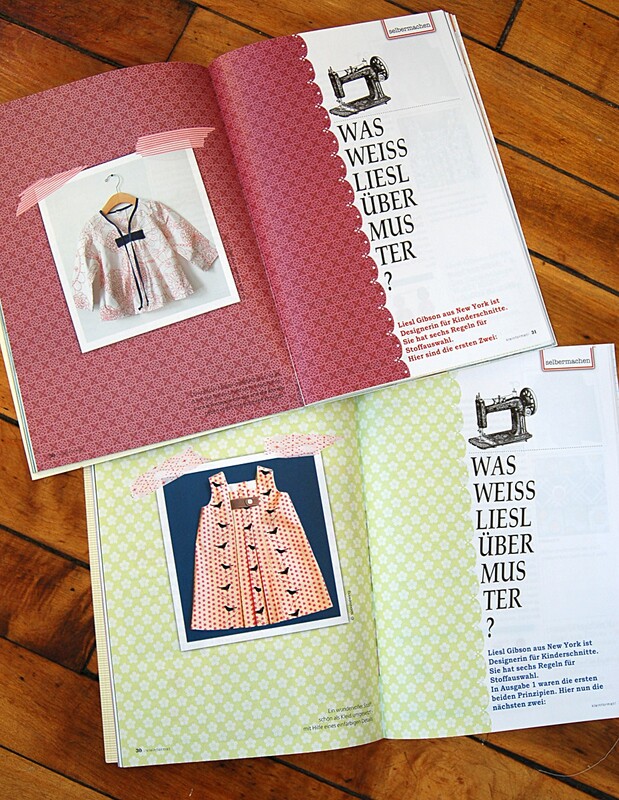 I can’t read German and really, really want to be able to when I look at these magazines. I learned about Kleinformat when the editor contacted us to adapt our Principles of Fabric Selection posts into a series of three articles for the magazine. Now I’m wishing I could read every upcoming issue. Kleinformat also has a blog, and Google Translator does a serviceable job of translating it into English. This magazine looks great and very inspiring! I’m German, but where am I going to get it here in Helsinki?! Well, I’m sure the net can be of help there! 🙂 Thank you for featuring it here! I wish they would translate the magazine like they do ottobre. I think we could learn so much from it! Congrats on your features! Thanks so much for sharing this! I actually do read German. I lived there for 4 years & now that I am back in the States I do not get much practice. So this will be perfect for me – I have to subscribe! What a great magazine! I love how it’s subitled “for creative parents.” In another lifetime, I lived in Vienna, so this is a lot of fun to read. There seem to be many more Americanisms in colloquial German than I remember 10 years ago. Thanks for sharing this little gem! Wonder if they’ll ship subscriptions to the US? I can read german, and I just love the magazines I could get over there. They really love details, and the people read these magazines from back to front. Of course, we seemed to be alot less stressed while living over there. Anyways thanks for bringing it to my attention. I am going to see if I can get my hands on this magazine. Basically, the title reads “What does Liesl know about patternmaking?” Wish I could get a copy. Congratulations on being a worldwide success!